This lovely bonsai set consists of a truly elegant oriental sweet plum tree (Sageretia theezans). This gift set comes complete with all that is needed to get started in the wonderful art of bonsai. • Elegant fruiting indoor bonsai which displays lovely red/tan new foliage and small purple fruits as it matures potted into a blue ceramic bonsai pot. 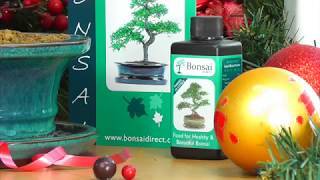 This is a fabulous festive indoor bonsai kit.